With vacation on the brain, I know I should be looking for more sundresses and breezy shorts -- but I can't seem to stop coming back to this sunny pair of wide leg trousers by 10 Crosby. I just love the horizontal stripe action going on here and could see them fitting in nicely with silky tanks and collared blouses alike (topped off with a straw panama hat!). 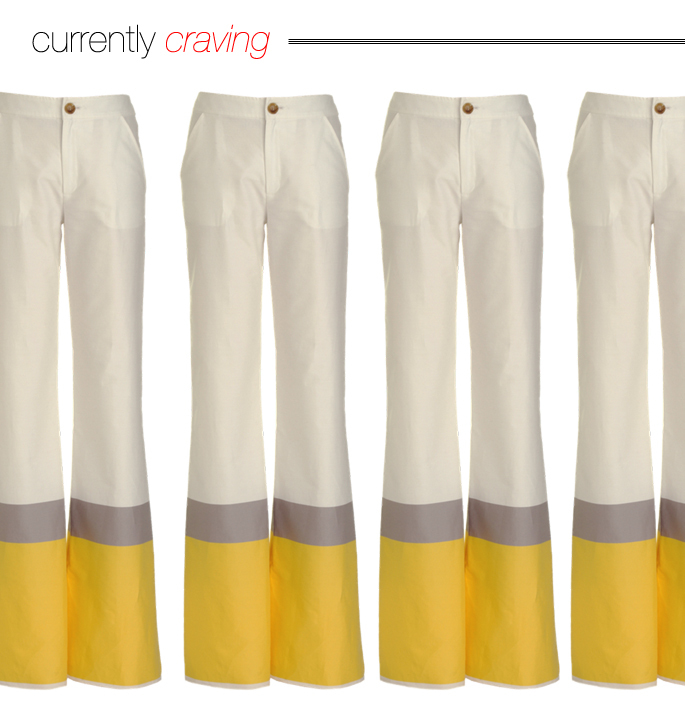 Plus, I'm on a yellow and white binge right now -- my new favorite summer color combination. very cool! not sure i could pull it off though..
You could totally pull something off like this! I love your style! These pants are really cool. You are going to look awesome! Oh yes! You've just got to get them!! I could totally see you rockin these Krystal! They are so fun and cheery and I just know you would make the perfect pairings for them! Colour block pants!! Love it!! Funky pants! completely your style and i admire you for pulling it off! love them! they would look so cute on you! totally krystal style! get'em! These are interesting! I'd love to see you style them! you would TOTALLY rock these - you HAVE to get them krystal! AM I THE ONLY ONE WHO SEES CIGARETTES? Maybe that's why you're "craving" them haha ok bad joke! Loving these pants! Would love to wear them for a fun day of exploring! Too cute! Wow! Those pants are amazing.